What Is The Best Drum Mic Kit? Shure has produced a winner for this category of best drum mics with an excellent quality set of microphones that also offers fantastic value for money. This is a 4-piece drum mic kit. Included inside are 3 x SM57 microphones and 1 x Beta 52A kick drum microphone. 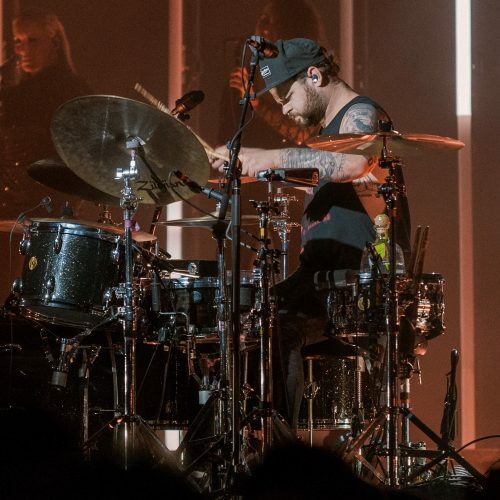 The Shure SM57 is the industry standard snare drum mic, and a high performing choice for toms, whilst the Beta 52A kick drum mic is a renowned, premium selection for kick drums. These are some of the best drum mics ever created, and represent the industry standard for recording drums in live applications as well as in the studio. They are the choice for performers, producers and engineers everywhere. The SM57 is the most popular instrument microphone in the world, and offers a versatile, legendary performance. Both the SM57 and Beta 52A are extremely durable and rugged dynamic microphones. These are truly professional quality and highly functional drum mics that are built to last, and are capable of withstanding the rigors of extensive touring. Also included in this Shure DMK57-52 4-Piece Drum Mic Kit is a heavy duty carrying case as well as three rugged drum mounts to attach the SM57s to your drum hoops. The high performance and versatility of these microphones in conjunction with their reliability makes these my top pick for the best drum mics on the market and a fantastic investment all round. In a close second place we have this complete premium drum-recording solution made by Audix. Included in this pack are 7 professional microphones used for recording a full drum set, all the mounting clips as well as a heavy duty aluminum flight case. This fantastic pack includes everything you will need to begin recording professional quality drums, and this is an expensive but worthwhile investment. You will never need to upgrade your drum mics ever again after buying this Audix DPD 7-piece drum mic kit. Audix has developed this award-winning package with microphones to work in tandem to capture all the drums as naturally and effectively as possible. All of the microphones in this package are industry standard microphones that are utilized by drummers and sound engineers in studios and on stages around the world. Included in the pack are a D6 for kick, i5 for snare, 2 X D2’s for rack toms, a D4 for floor tom and 2 X ADX51 condenser mics for overheads. These high quality drum microphones deliver a clear and powerful sound, and can handle high sound pressure levels without distorting. The microphone units are ultra-low mass yet highly rugged and durable. This drum mic pack represents an outstanding combination of microphones designed to meet the demands of today’s professional drummer both on stage and in the studio and is a high quality and worthwhile investment. In my opinion it is the best 7-piece drum mic kit available on the market. AKG has really delivered a great product with this new and affordable 7-piece drum mic kit, containing 7 optimally tuned drum microphones that are designed to work in harmony together. Despite the affordable price tag, this is definitely a roadworthy and formidable set of drum microphones that delivers excellent results. Included in the pack are 7 microphones from the Perception Live series, which are well built with durable metal casings and are resilient to high sound pressure levels. The AKG Session drum mic kit consists of a P2 kick mic, 4 X P4 mics for toms and snare plus 2 X P17 overhead microphones. Also included with the set are mic clips for the overheads, and mounts for the P4 microphones. The kit is housed inside a heavy-duty aluminum carrying case. In operation these microphones give the drums an immediately impressive sound, and have a full dynamic range that really brings the drums to life! The P2 mic delivers a punchy low end from the kick whilst the P4s on the snare and toms are equally impressive in capturing clear and defined sounds. The P17 overheads are pin-sharp and easily capture all the nuances of the cymbals. AKG is a world leader in producing quality recording equipment, and this is an affordable set that includes all the microphones and attachments to begin recording quality drum sounds. This microphone set is the ideal all-in-one starter kit for any drummer looking to invest in his first set of drum microphones. This is the best set of affordable drum mics on the market right now. Up next for review we have this complete drum mic package from Sennheiser. It is similar to the Audix DP7 drum mic kit in the way it also features 7 instrument-specific microphones for a full drum set. This drum mic pack includes 7 specifically chosen mics that are Sennheiser’s flagship range of microphones. They deliver a balanced and clear sound and are all resilient to high sound pressure levels as well as the inevitable physical use from touring. The microphones included are 1 X e602 for kick, 4 X e604 for snare and toms and e614 overhead condenser mics. All the microphones include a 10-year guarantee for your peace of mind. All of these microphones are professional grade microphones that are being played on arena tours and utilized by professional drummers across a diverse range of musical genres. Within this Sennheiser 600 Drum Mic Kit I particularly like the e604 dynamic microphones for toms. They are small and unobtrusive, and are well built. In addition to this the clamps allow for optimal positioning on the drums, even on the snare drum. In my opinion these are the best drum mics for recording toms. The e602 microphone is a premium kick drum microphone, and captures and delivers clear and punchy kicks on stage and in the studio. It is a light microphone yet is ultra tough and resilient. Overall this is a very effective drum microphone solution, featuring some of the best drum mics in the industry. Sennheiser has developed highly functional mics that perform brilliantly and deliver balanced and clear signals. Up next for review we have this complete drum recording solution from Shure, which features 7 specifically selected microphones to deliver excellent sound quality when recording a full drum set. These microphones are from the PG ALTA range, which honors Shure’s 90-year tradition of manufacturing exceptionally high quality audio products. This Shure PGA7 7-Piece Drum Mic Kit has been designed to deliver rock-solid sound and reliability at an accessible price for aspiring drummers. Included in the kit is 1 X PGA52 kick drum mic, 1 X PGA57 mic for snare, 3 X PGA56 mics for toms and 2 X PGA81 overhead condenser microphones. Also included in the generous pack are 7 XLR cables that measure 15 feet each, all the clips and mounts you’ll need plus a protective carry case. These microphones sound fantastic. They have smooth frequencies and deliver a clear and concise sound. All of the dynamic mics excellently pick up a full and well-rounded sound from the drums, whilst the overheads are sensitive and crisp. Although these microphones are not Shure’s flagship range, and do not offer quite the legendary performance of the SM57 or Beta 52A, these mics share similar frequency patterns to their expensive counterparts. They are just as rugged and deliver a rich and full sound. Although this is not a full drum set recording solution, this is a set containing 3 X e604 microphones, and these are in my opinion some of the best drum mics to use for toms. For the price you may not receive the fantastic value of the AKG Session drum mic kit, or Shure PGA 7 drum mic kit, both of which containing 7 microphones. However, with this product you will receive 3 of the best dynamic drum mics, and will never require an upgrade. The e604 delivers a fantastic frequency response range of 40Hz-18kHz with a tight cardioid polar pattern to capture the direct sound of the drums. These microphones are designed near perfectly, being virtually bulletproof and leaving a very small footprint on the drum set with its miniature size. Sennheiser puts absolute faith in the quality of these microphones with a 10-year guarantee. The mic is attached neatly to hoop of the toms and snare drums with a mic clip that is easy to use and the microphone is never an obstruction due to its practical size. The sound obtained from these microphones is crystal clear. They capture a smooth and detailed response that has just the right amount of high-end attack as well as warmth that hits just the right spot. The Sennheiser e604 dynamic mic kit delivers brilliant results, combining an excellent tonal response and rock-solid build. The e604 is a difficult mic to beat, and makes a great investment to the future of your drum recording. This is a highly practical drum recording solution that is offered at an affordable price. Sabian has developed and manufactured a simple 3 mic setup to be utilized with a mixer specifically designed for recording drums. This kit is the simplest solution available for recording drums. It has been intended to streamline the process of drum recording, which can often be a tricky and difficult process. With this Sabian 4-Piece Drum Mic & Mixer Kit it is so easy to capture sounds, which are recorded straight onto the mixer with on-board recording. The microphones included in this pack perform well. The overhead condenser mics have been optimized for cymbals, and the large diaphragm kick drum mic has been tuned to capture low end and withstand high sound pressure levels. Although this is an easy-to-use pack, I am disappointed with is it its lack of versatility. The mixer has virtually no connectivity options to work with a DAW on a computer, so you are restricted to the on-board recording capabilities of the included Sabian drum mixer. However, it is a good drum mic kit if you are looking to record drums for an intimate sized venue. Overall this is a very easy to use package that makes a good solution for recording drums at a small venue. It includes gig-ready stereo XLR outputs that allow you to send pre-tuned drum sounds straight to a venue PA.
Lastly on our list we have this drum mic kit produced by Pyle USA. This is a low budget set of microphones and this is an option if you are looking for something cheap and cheerful, to simply get the job done. These microphones have been tuned to capture a wide frequency range and they are compact and versatile. The drum mic kit includes a durable carry case as well as all the necessary mic clips and adaptors to get started. This really does offer fantastic value, but it is important to consider that this pack will not offer the quality of the premium audio brands that feature in this list. But the microphones themselves do deliver a reasonable sound quality and they perform their role as a cheap and affordable solution for drum recording. The response is fairly flat but surprisingly clear. I would recommend this Pyle 7-Piece Drum Mic Kit as a very first drum mic kit for a beginner looking for an introduction into recording drums. However, you will certainly require an upgrade to a premium drum mic kit to achieve a significantly better recording quality further down the line. Quality sounding drums lay down the foundation of any mix. Smooth, balanced and well-rounded drum tones make for an enjoyable listening experience regardless of the musical genre. Different musical styles will indeed demand specific types of drums, drumheads, cymbals, and ways of playing the drums to suit the style. But the recording process in a studio will typically follow a proven formula of one microphone per drum kit component and two or more overhead microphones, and also some room mics if available. To have fantastic sounding drums on a mix, the very first step is to capture great sounds at the source. This requires recording good sounding drums that have been tuned correctly, ideally with brand new high quality drumheads. Recording drums is undoubtedly one of the trickiest and time-consuming parts of the recording experience, but the rewards of a well-thought out recording approach make it well worth the effort. How Many Mics Do I Need? It is good to look for a drum mic kit that offers a larger number of microphones, as this will offer you the opportunity to experiment with different microphone positions and to capture each individual drum set component effectively. However, quality is more important than quantity when it comes to microphones as well as the recording approach. Two or three well-placed quality microphones will lead to a better result than ten poor quality microphones that are set up incorrectly. I have achieved fantastic drum sounds from a single kick drum microphone as well as one overhead microphone. It is largely about placement as well as the quality of the room and the drums and cymbals themselves. But of course, the best quality drum sounds will always be achieved at professional recording studios, with a large number of microphones and in a room with brilliant acoustic sound properties. Recording my band’s debut album at Graphic Nature Audio in New Jersey, we used 17 microphones to capture the drum set from a variety of angles and proximities. Many of these microphones were room microphones to achieve a ‘live’ and realistic feel within the music. What Else Do I Need To Record Drums? After you have purchased a set of drum mics, you will also need various other components to begin recording drums into a computer. Most importantly, you will need a mixer or audio interface that has enough XLR inputs to accommodate all your microphones. Audio interfaces can be expensive, but it’s definitely worth finding one that delivers a clean signal response and has warm preamps and converters. Once you have the microphones and the audio interface, you will also require XLR cables which are ideally 5 meters long or more. If you are utilizing a 7-piece drum mic kit, you will need 3 microphone stands. One of these is for the kick drum mic and the remaining 2 are for the overhead mics. 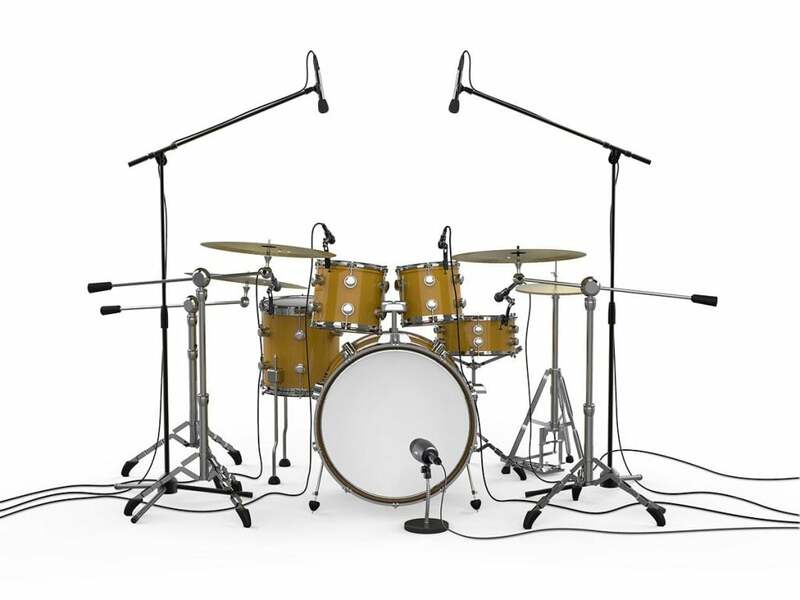 All of the drum mic kits in this guide include clips allow the tom mics to be attached to the hoops of the drums for easy and convenient microphone placement. Now you should have all the microphones all set up on the drum kit, and the functionality to capture and record all the drums you desire! The drum set with all the 7 microphones (1 kick, 1 snare, 3 toms, 2 overheads) should look like this! There is a lot of experimentation and microphone positioning involved within drum recording, and as I have mentioned there are ways of recording drums with anything between 2 and 20 microphones. Having a greater number of microphones at your disposal offers you greater recording flexibility as well as a cleaner and more direct pickup from each individual drum set component. This list features the best drum mics available to suit all different budgets. It is important to remember that quality does reflect price, and when purchasing recording equipment you will either buy nice or buy twice. High quality microphones deliver an unmistakably smooth and crystal clear sound that translates the drum sounds captured onto quality recordings in popular music you hear every day. The Shure DMK57-52 4-Piece Drum Mic Kit offers you the same premium quality microphones that are heard on classic hit recordings and at an affordable price, and allows you the opportunity to invest in overhead microphones at a later date. This kit includes the best drum mics available for the money. If you are on a budget but you want a full drum recording solution with 7 drum microphones, the AKG Session 7-Piece Drum Mic Kit is the best drum mic kit at a modest price. It delivers renowned AKG quality and brings drums to life with clear detail. If you are prepared to spend for a top quality and complete drum mic package then the Audix DP7 7-Piece Drum Mic Kit is the best drum mic kit for you. It is an award winning set which has been meticulously developed to deliver the best drum sounds possible, and still at a very respectable price for the quality that is offered. I hope this buyers guide has helped you with your search for the best drum mics available on the market! I believe I have selected the best microphones for the money that will offer years of reliable service for all of your drumming needs for both live and in the studio, and across a range of budgets.